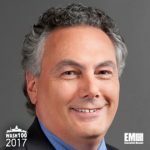 Executive Mosaic is glad to announce Tony Moraco, CEO of Science Applications International Corp.[stock_quote symbol=”SAIC”], as the latest inductee into the 2017 Wash100 — Executive Mosaic’s annual selection of the most influential voices in government contracting. Moraco has led the McLean, Va.-based government services contractor since its 2013 spinoff from former parent Leidos Holdings, which held the name of SAIC between Dr. Robert Beyster’s launch of the company in 1969 and the split. Calendar year 2016 for the “new” SAIC saw the company exceed Wall Street’s consensus earnings forecasts in all three quarterly financial reports released and the resulting positive investor sentiment helped the stock close up 85 percent for the 12-month period. SAIC ended 2016 as the second-best percentage gainer in Executive Mosaic’s GovCon Index of 30 publicly-traded government contractors and continued efforts to position itself for low-single digit organic sales growth in future years after the May 2015 acquisition of Scitor for $790 million. “Collectively we’re all looking at this modestly favorable outlook for the next five years, but note although we’re at the very front end of that cycle, it still takes some time to convert that,” Moraco told investors in September. Scitor returned to SAIC a footprint in the intelligence community that went to Leidos after the separation as efforts to recognize both synergies and develop business development pipelines continued in 2016 post-acquisition, Moraco said during that conference call. “On the ISR and space platforms that Scitor has provided historically, that’s combined with the customer groups,” he added.